Mint leaves are considered best to cure mouth odor and help to fresh up the breath. By chewing mint leaves, particularly after meals, is a very good remedy for bad breath. Baking soda is also considered very good for treatment of foul mouth smell.It changes the pH (acidity) level in your mouth, which results in a less favourable environment for odor-causing bacteria. Use a gargle of baking soda dissolved in warm water It keep your tongue and gums bacteria free.Besides this you can simply add some baking soda onto your toothbrush, brush with it, and then rinse with water. Another option is to purchase toothpastes that already contain a small amount of baking soda. Sunflower seeds are also very effective in getting rid of bad breath and are particularly good if you chew some seeds after each meal followed by a glass of water. Cloves(Long) are a good natural "bad breath" remedy but often people don't like the taste of cloves but if you do though then go ahead and chew one clove after each meal to reduce your bad breath. Fenugreek is also very beneficial in getting rid of bad breath. Tea made from fenugreek(methi) seeds is also a good bad breath home remedy. Pineapple juice is an other good way to cure the problem of bad breath. 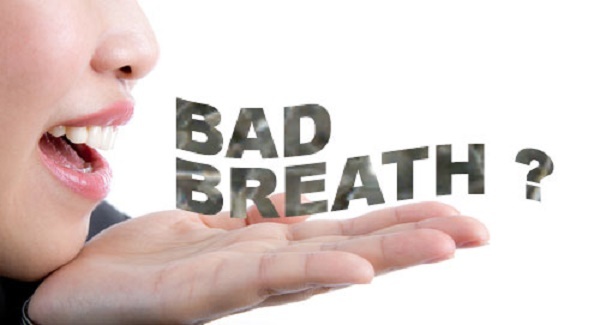 Consumption of bad breath on a daily basis is considered very effective to reduce the smell of bad breath. Yoghurt(curd) is very effective way to cure bad breath completely as it contains the good bacteria that your body needs. Eat yoghurt daily for six to seven weeks for best results. Squeezing Lemons into water and using as a gargle is also a good natural remedy for treatment of bad breath.You need to use the gargle frequently and continue to do so until all traces of bad breath have gone. Apple Cider Vinegar is very effective mouthwash that provides long-lasting relief from bad breath. To prepare a mouth wash simply dilute half tablespoon of the vinegar into a glass of water and gargle it in your mouth for 10 seconds at a time. This Mouthwash is very helpful to cure mouth odor. Apples are a great source of good health and are considered very good for curing bad breath as they act as a purifier for the mouth and remove the bacteria that cause bad breath. Parsley leaves are rich in chlorophyll and are natural deodorizer. Chew some parsley leaves regularly for fresh breath. Cardamom(Moti Elaichi) seeds acts as a breath freshener. You can chew some seeds of cardamom to prevent bad breath. Antimicrobial properties of fennel are very helpful to fight against the bacteria in the mouth. To cure the problem of mouth odour you can chew about 1 tablespoon of fennel seeds or you can drink fennel tea twice a day. To make this tea, steep about 1 tablespoon of fennel seeds in a cup of hot water for 5 to 10 minutes. Chewing Basil Leaves is also one of the best home remedy for treatment of Bad Breath. Chew basil leaves on a regular basis to cure and prevent mouth odour. Powerful halitosis fighting abilities of sage tea are very helpful in getting rid of bad breath. To make this tea, steep one teaspoon of dried sage in a cup of hot water for five minutes. Strain and drink this tea twice a day to keep your breath fresh. Eating a citrus fruit that is high in citric acid (such as an orange, lemon, or grapefruit) can help improve your breath significantly. The acid in such fruits stimulates the saliva, which helps suppress some of the Bad odor-causing bacteria. At the same time, the tangy taste of such fruits leaves the mouth smelling fresh. (i)If you have a bad breath problem then it is advisable to brush your teeth after every meal.This habit not only reduce Bad breath but also prevent bad breath. (ii)While using a mouthwash Never swallow it and always spit out after 10 to 15 seconds. (iii)Avoid mouth washes containing alcohol as these can dry the mouth and increases bad breath. (iv)Try to avoid food products that contain white flour and sugar. (v)You can drink a variety of fruit juices but avoid drinking coffee or carbonated drinks. (vi)If your bad breath persists even after trying these natural remedies, consult a doctor or dentist to see if there is a more serious underlying problem.